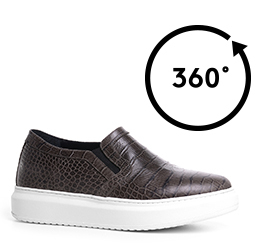 Elevator slip-on with upper in elegant calf leather printed crocodile and comfortable sole made of 100% natural rubber. An extra comfortable height increasing shoe, ideal for spring which combines the casualness of a slip-on sneaker to the prestige of the exotic leather printing. The inner elevator system ensures a total height increase of 2.6 inches.